Following the successful conclusion to acceptance testing in Texas, SpaceX’s Falcon 9 v1.1 – an upgraded version of the Falcon 9, which also aims to become fully reusable – has begun to arrive at its Californian launch site at Vandenberg Air Force Base. The rocket is scheduled to debut with the CASSIOPE mission in early September. Following the successful launch of the CRS-2 (SpX-2) Dragon to the International Space Station (ISS) earlier this year, the Falcon 9 will next launch with additional capability. At the heart of the rocket’s upgrades are its nine Merlin 1D engines, arranged in their new octagonal placement on the core stage. The additional performance from these engines – which have been undergoing testing since 2011 – will increase the payload capability of the Falcon 9 to over 29,000 pounds to Low Earth Orbit (LEO). Following numerous successful single engine test firings, nine Merlin 1Ds were installed into the core stage on the test stand at SpaceX’s Rocket Development and Test Facility in McGregor, Texas. Several tantrums – common place in the rocket business – had to be subdued by the SpaceX team, although it was noted they were working with eight engines classed as non-flight hardware, which were deemed to be less robust than the flight version of the Merlin 1D. 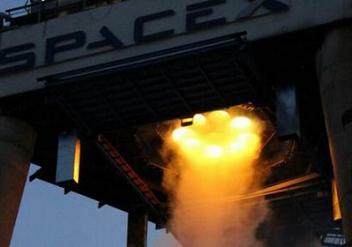 Development testing continued to suffer from aborts for varying reasons during May and June, prior to SpaceX confirming a firing in the second half of June completed first stage development testing, allowing for the progression towards acceptance testing and flight preparations. 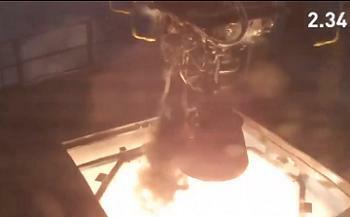 on the debut mission of the upgraded Falcon 9. 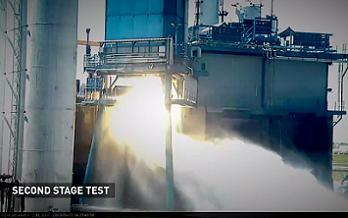 Thanks to the hard work conducted during the development testing, the full duration first stage firing was conducted successfully. 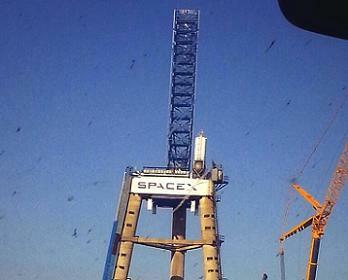 SpaceX initially noted they had nothing to add “at this time” to Mr. Musk’s tweet – when asked for a status report – although a visible sign the testing had concluded for the core stage was seen via a tweeted photograph of the empty test stand, with a large crane on site to remove the core ahead of its shipping. The company did send out an e-mail to the media – including this site – confirming “the full mission duration firing of the next generation Falcon 9 booster was completed on Sunday, July 14, 2013 at SpaceX’s rocket development facility in McGregor, Texas. “The booster’s nine Merlin 1D engines fired for approximately three minutes, simulating what the booster may experience in flight before stage separation. Tom Mueller, Vice President of Propulsion Development at SpaceX, then confirmed the core was in preparation for shipping to Californian during a conference in San Jose. When asked for a response, SpaceX opted not to comment. However, NASASpaceFlight.com understands that the first stage is almost ready to depart Texas, with shipping set to begin this week, with the next core stage (known as the Flight 7 core) set to take its place shortly after. All other elements of the new Falcon 9 are also in various stages of integration, with the Interstage and Second Stage – debuting the VacD – already at SpaceX’s Vandenberg launch site. The new 43×17 foot diameter fairing – that will debut during the CASSIOPE mission – is also set to ship to the site shortly. Mr. Mueller also noted that the debut v1.1 launch from Space Launch Complex 4E (SLC-4E) is currently targeting September 5. 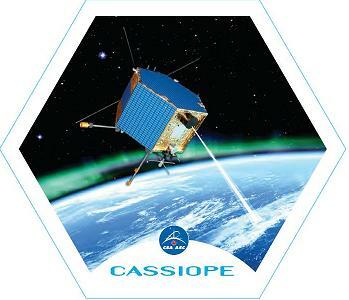 The payload – the CAScade, Smallsat and IOnospheric Polar Explorer” (CASSIOPE) – is a made-in-Canada small satellite from the Canadian Space Agency. CASSIOPE is hexagonal in shape, measuring just 180 cm corner-to-corner and 125 cm high and weighing in at just over 500 kg. 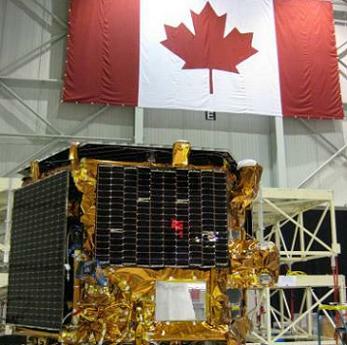 It is comprised of three working elements that will use the first multi-purpose small satellite platform from the Canadian Small Satellite Bus Program. This generic, low-cost platform will carry two payloads: e-POP, a scientific payload consisting of eight high-resolution instruments used to probe the characteristics of near-Earth space, and Cascade, a high data rate, high capacity store and forward technology payload from MDA Corporation. Together, e-POP and Cascade will achieve both a scientific and a commercial objective. providing scientists with unprecedented details about the Earth’s ionosphere, thermosphere and magnetosphere, helping scientists understand the cause and effects of potentially dangerous space weather. Cascade will demonstrate a new digital communications ‘courier’ service provided by MDA. Pending a successful mission with CASSIOPE, SpaceX will then move to the launch of what will be the debut launch of a geostationary satellite, with the launch of the SES-8 spacecraft from Cape Canaveral Air Force Station in Florida. Completing what is hoped to be a busy period of launches for SpaceX and their new Falcon v1.1, the company plan to loft Commercial Launches for Orbcomm and Thailand’s Thai Comm. The next Dragon spacecraft would then greet the upgraded Falcon 9 for their CRS-3 (SpX-3) mission to the International Space Station (ISS), which currently has a place-holder of December. However, according to L2 information, ongoing discussions are taking place relating to a potential Visiting Vehicle (VV) conflict. 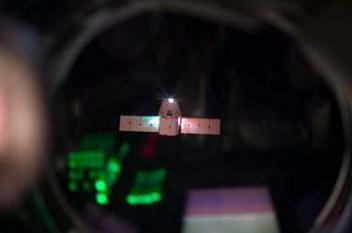 Providing Orbital’s OrB-D mission proceeds as planned, allowing for a December launch of OrB-1, one of the CRS missions will have to move to change its docked period to Node-2 Nadir between January 26 to February 25, 2014. A decision won’t be made until later this year, following the OrB-D mission and SpaceX’s progress during their busy upcoming mission manifest.